The intersection between technology and art is something that’s been on our minds a lot lately. We recently featured the dance company The People Movers and the world premiere of their original performance HackPolitik, a choreographed show about computer hacking, politics, and the future of online communication. We also discussed the ways in which some artists are rejecting modern technologies, but how others, like David Hockney, are happy to let it influence their work. Regardless of whether technological advancements are universally embraced, the “Digital Age” that we are living in has irrevocably changed many facets of daily life. According to the KKR Global Institute, headed by David Petraeus (KKR Global Institute Chairman), “The European Union alone boasts approximately 368 million online users and 193 million Facebook users versus 245 million online users and 166 million Facebook users in the U.S.” The Global Institute’s studies reveal how the digital age has changed how we shop, consume media, do business, and literally interact with one another. Social media – on public, professional, and personal levels – has pioneered new forms of communication that previous generations never would have believed was possible. Anyone has the capability to magnify his or her thoughts to a global audience, and yet, in some ways social media has alienated individuals and eliminated previous modes of contact. Charlene deGuzman, Miles Crawford, and Rachel Knoll are three artists who have examined the isolating side of social media communication; working with film and multimedia, they have examined the ways in which being “connected” has never made some feel so alone. Writer/actress Charlene deGuzman feels alienated from those around her because of technology. The short film I Forgot My Phone was written by deGuzman and Crawford, and went viral almost immediately after it was posted on YouTube. The film stars duGuzman and a few dozen friends, and is directed by Crawford. In it deGuzman portrays a woman who is going through the motions of daily life in solitude, as those around her choose to interact with others solely through the use of their smart phones. The film has garnered nearly 34,000,000 views at the time this article was posted, a testament to the ways in which I Forgot My Phone resonates with many. Rachel Knoll tackles a specific social media channel in her project Listen and Repeat, an examination of the isolated feelings many Twitter users express. In her short film, “a modified megaphone uses text to speech capabilities to recite the tweets composed with the tag ‘nobody listens’ from the social media website Twitter. 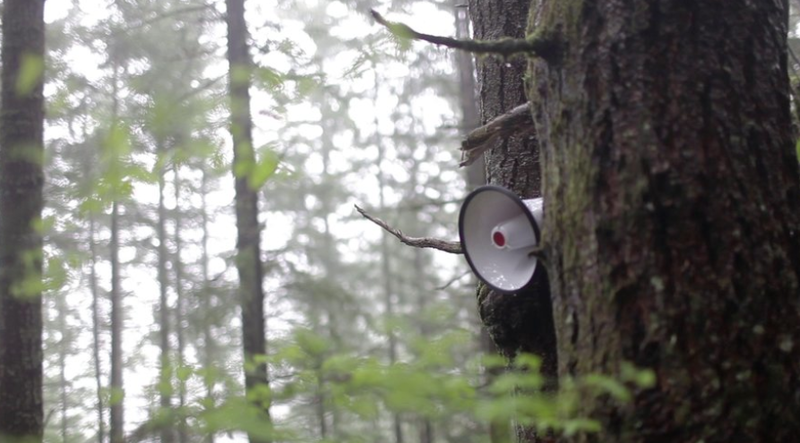 The megaphone has been installed on a mountain in Washington State and dictates tweets to an audience of trees,” explains Knoll. The film’s repetition of woeful cyber outcries is disheartening to say the least. It speaks to the anonymity that still exists in the virtual world, a state of being that has impacted many people. Do you feel that these creative projects effectively examine the ways in which social media impacts our lives?